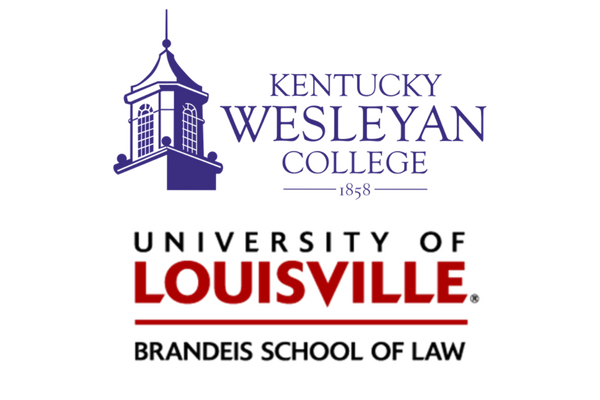 Kentucky Wesleyan College announces an exciting partnership with the University of Louisville Brandeis School of Law. A new innovative 3+3 Accelerated Law Program will allow Wesleyan students to obtain a juris doctorate no more than six years after their high school graduation. Students in the following academic majors will enroll as undergraduates at Wesleyan through their junior year: accounting, business administration, criminal justice and criminology, English, history, legal studies or political science. In their fourth year of study, those admitted to the Brandeis School of Law will fulfill their senior year of undergraduate study and earn their bachelor’s degree by completing their first-year of law school. Two years later, they will receive their juris doctor degree from UofL. The program allows a student to receive both their undergraduate and law degrees with one less year of coursework and expense than is typical, allowing them to begin their legal careers one year sooner. Kentucky Wesleyan College President Barton D. Darrell makes an announcement at a news conference Friday about the Collaborative Partnership with university of Louisville Brandeis School of Law in Rogers Hall in the Winchester Center. A new innovation 3+3 Accelerated Law Program will allow Wesleyan students to obtain a juris doctorate no more than six years after their high school graduation. Kentucky Wesleyan College is partnering with the University of Louisville Brandeis School of Law to allow students to spend three years at each institution, earning both their bachelor’s degree and a Juris Doctor degree in six years. It’s called a 3+3 Accelerated Law Program, and leaders say it’s the first such coordinated, co-institutional curriculum in the state. Traditionally, students spend at least four years in undergraduate studies and must earn a bachelor’s degree before they can qualify for a three-year law school program. Through this accelerated course of study, however, officials say KWC students can spend just three years in Owensboro before their courses transfer to Louisville. Their senior year at KWC and freshman year in law school will be the same, saving the students a year’s worth of often expensive coursework and readying them for the work force earlier. Darrell said the positive financial impact could exceed $200,000 per student, when taking into account cost savings on a year’s worth of loans over the course of a career in law. The announcement comes after nearly a year of negotiations with U of L and conversations with KWC faculty to ensure a seamless transition of study, he said. Vice President for Academic Affairs Paula Dehn said professors initial concerns were whether students could fulfill undergraduate obligations before moving on to study law. She did caution that the program should be monitored closely by students’ academic advisers and that the decision to participate in accelerated study must be made early. Students in the following academic majors can enroll in the program: accounting, business administration, criminal justice and criminology, English, history, legal studies and political science. Before completing their junior year at KWC, they must meet all Brandeis School of Law admission requirements. The accelerated program was launched at the main campus in Louisville, and students there are in their junior year of undergraduate study. Law school Dean Susan Duncan said she does not believe the coursework presents any undue burdens to students, especially as many of them begin their college careers with credit hours they earned in high school. It’s part of a trend in secondary and higher education, she said, to mitigate an education’s financial load on students. Duncan said she has offered this opportunity to a number of colleges and universities throughout the state, but KWC was the first to sign an agreement. The program goes into effect immediately. There are actually more eligible majors in Owensboro than at the main campus in Louisville, representing what Duncan called a willingness on the part of college staff to find avenues through which law school and undergraduate coursework can align. KWC has a standing partnership with the U of L School of Nursing through Owensboro Health. Students in the pre-professional nursing program can earn a Bachelor’s of Science in Nursing degree through a satellite program at the health system’s Parrish Campus in Owensboro. Kentucky Wesleyan College has announced a partnership with the University of Louisville Brandeis School of Law. The new 3+3 Accelerated Law Program will allow Wesleyan students to obtain a juris doctorate no more than six years after their high school graduation. Students in Accounting, Business Administration, Criminal Justice & Criminology, English, History, Legal Studies, or Political Science will enroll as undergraduates through their junior year. In their fourth year, those admitted to the Brandeis School of Law will fulfill their senior year of undergraduate study and earn their bachelor’s degree by completing their first year of law school. Two years later, those students will receive their juris doctor degree from the University of Louisville. The program allows students to receive both degrees with one less year of coursework and expenses. President Darrell also thanked the Brandeis School of Law and Law Dean Susan Duncan for helping form the partnership.